Belch Base is an Event Course in Super Mario Maker based off of EarthBound, released on December 18, 2015. It unlocks the Master Belch Mystery Mushroom costume upon completion. The level begins with a single ? Block, leading to a Mystery Mushroom. It leads to a warp pipe, which in turn leads to an area with many Bob-ombs and another segment with Buzzy Beetles, which can be kicked into a ? Block containing another Mystery Mushroom. The next segment consists of Hard Blocks moving on tracks, with spikes as an added hazard. A Warp Door is approached, followed by a segment with Cannons and another Mystery Mushroom. 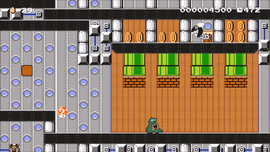 After a segment with warp pipes and winged Chain Chomps, another warp pipe is reached, which leads directly to the Goal Pole. Nobody can stop you when you're the great Master Belch! Use your slime powers to assert dominance over, er...your own base. By the way, you have precisely 4 chances to transform into the great Master Belch. If you find them all, you'll be filled with an overwhelming sense of satisfaction! Probably. This page was last edited on November 15, 2018, at 16:49.